In 1996 one of the most unusual aircraft ever to be exhibited at the world's greatest gathering of experimental aircraft debuted at AirVenture, Oshkosh. By then people were used to Burt Rutan's extraordinary designs but the Boomerang, which drew them in their thousands, left them flabbergasted. One visitor ran up to Rutan and said, "What in the hell were you smokin' when you laid that one out?" Rutan wasn't smoking anything; it was merely his genius at work. Rutan's basic goals were to design an aircraft that would provide optimum performance from two turbocharged 200 hp Lycoming reciprocating power plants that could be controlled even after the onset of stall and would preclude the problem of asymmetrical thrust associated during engine failure in conventional twins. Conventional twins are generally considered safe in the event of an engine failure. However, if an engine were to fail at a critical time, such as take-off, there is the added danger because of the resulting asymmetric power developed because the aircraft suddenly has tremendous drag on the side with the dead engine and thrust on the side with the working engine. If the pilot is not skilled, and well-practiced in emergency manoeuvres, there is a high risk of things going horribly wrong. In the Boomerang, all of the asymmetry is there to eliminate the asymmetry experienced during an engine failure in symmetrical aircraft. If an engine were to fail, the pilot doesn't need to do much to maintain control. The airplane continues flying straight. 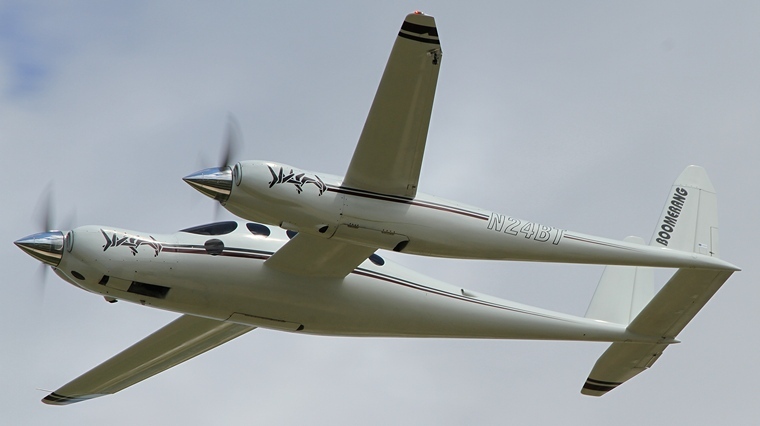 As a basis for the design of the Boomerang, Rutan used the specifications of the iconic Beechcraft Baron 58. Using the same engines as the Baron the Boomerang's asymmetrical design allows it to fly faster and farther. The very distinct appearance of the Boomerang might look odd as indeed it is. The right fuselage houses the cockpit and passenger seats, a 210-horsepower engine as well as the retractable nose wheel and right twin wheel undercarriage. The left fuselage is shorter and devoid of a passenger cockpit but houses the baggage compartment, a 210-horsepower engine de-rated to 200 Hp mounted five feet behind the right engine as well as the left retractable twin wheel undercarriage. The wings are attached at different angles and are swept forward-swept with the right 57 inches (1.447metres) shorter than the right. Even the tail is different, on the right side the horizontal stabilizer extends outwards in the conventional way whilst on the left it ends flush with the vertical stabilizer. The pilot flies from the right seat and not the left. There is a control stick on the left, but no rudder pedals. Rutan's Boomerang represented a significant increase in performance, efficiency, excellent general flying qualities and engine-out safety compared to conventional twins. However, like many of Rutan's creative designs, the Boomerang never saw production. The Boomerang became Rutan's personal aircraft and he flew it until 2002 when she was hangared with the intention to be donated to a museum upon his anticipated retirement in 2011. Fortunately Rutan changed his mind and Tres Clements, a Scaled Composites engineer, was given the task of getting the Boomerang airworthy and in 2013 she again returned to AirVenture, a fitting tribute and legacy to one of this century's most innovative and prolific designers.